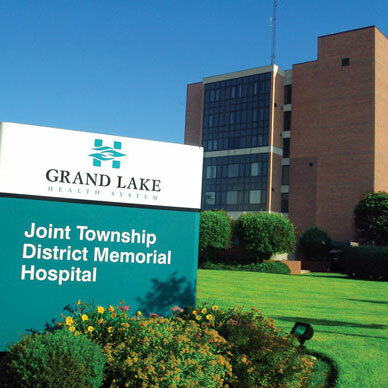 ST MARYS, OHIO–Joint Township District Memorial Hospital (JTDMH) and Pain Management Group (PMG) announce today a partnership to expand balanced pain management care in St. Marys and surrounding areas. New Day Pain Management Center will open in May 2014 and will be located at 975 Hager Street, St. Marys, Ohio. To make an appointment, patients should call 419-394-9520. The new pain management center will offer treatment for a variety of conditions including neck and back pain, headaches, fibromyalgia, chronic pelvic pain, complex regional pain syndrome (CRPS), nerve damage, as well as pain associated with arthritis, muscle spasms and shingles. Patients needing outpatient procedures such as epidural steroid injections, facet joint injections, radiofrequency ablation, spinal cord stimulation, myoneural injection (with or without Botox), nucleoplasty, selective nerve root block, stellate ganglion block and lumbar sympathetic block will be able to have these performed locally at JTDMH. The lead physician of New Day Pain Management Center, Dr. Will Hogan, will create an individualized treatment plan for each patient based on a number of considerations, including the cause and level of pain. Dr. Hogan is board certified in anesthesiology and pain management. He completed his residency and fellowship at the Mayo Clinic College of Medicine in Jacksonville, Florida. “We offer some of the most advanced treatments available today for pain management. These treatments are more tolerable and less invasive than in the past,” says Dr. Hogan. “Millions of people suffer from acute and chronic pain that affects their daily activities and pain management is proven and effective at getting people back to a normal life,” he added. For more information or to schedule an appointment, call New Day Pain Management Center at 419-394-9520.